"Caracol Cruzando" explores a story of immigration. 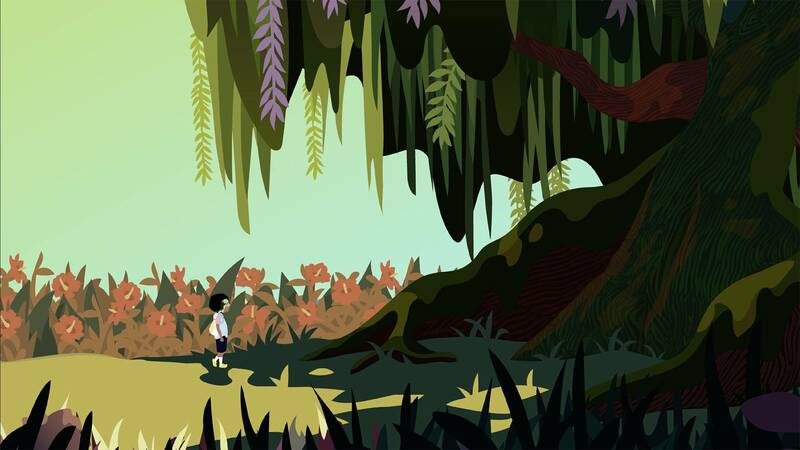 Writer, Director and Lead Animator Pamela Maria Chavez discusses why she wanted to share this story both through animation and from a child's perspective. PBS: What inspired you to tell this story through animation and from a child’s perspective? Pamela Maria Chavez: I was inspired by a desire to tell this story from a perspective within me that I felt I hadn’t tapped into. As an artist, I’m always challenging myself to think of new ways of describing my feelings, of telling a story, of sharing an experience. The challenge for me was to tell this story without projecting my own adult feelings onto it. My inclination (rightfully so) as an adult is politicize, rationalize, and defend the position of my family’s status and the status of so many immigrant families within the U.S.
We’ve seen the dehumanizing rhetoric, the polarizing politics; I wondered, is there a way to re-humanize without picking the conversation up from this negative paradigm? How do I take control of my narrative again? By telling this story from a child’s perspective, you have an opportunity to look at the motivations and implicit qualities that are required to make this journey - something genuine and authentic. I also wanted to make something fun, funny and playful. This eases the tension in the film, and I believe allows an entry point for children and families to talk. I want to tenderly open this conversation up to children. I want to give a platform for children who may have immigrated to see themselves in this story. I want a child who may not know what immigration even means to begin asking questions about borders, about equity. It’s inspiring to think about what children and families will do with this story. It might not be easy — we aren’t used to prioritizing the voices and thinking of children, and we stop ourselves because it’s complicated and full of hard topics — but I believe we have a lot to learn from this exchange. PBS: There are a lot of aquatic elements to this film like the whale that splits up the fish family (Anais and her family), the shell necklace Anais receives from her mother, the crab pinching Tiku, and of course Tiku himself. What do these mean to you? Pamela: In Costa Rica nature is a part of your daily life. You wake up to the sound of roosters, of the rain, thunder, and of howler monkeys depending on where you live. 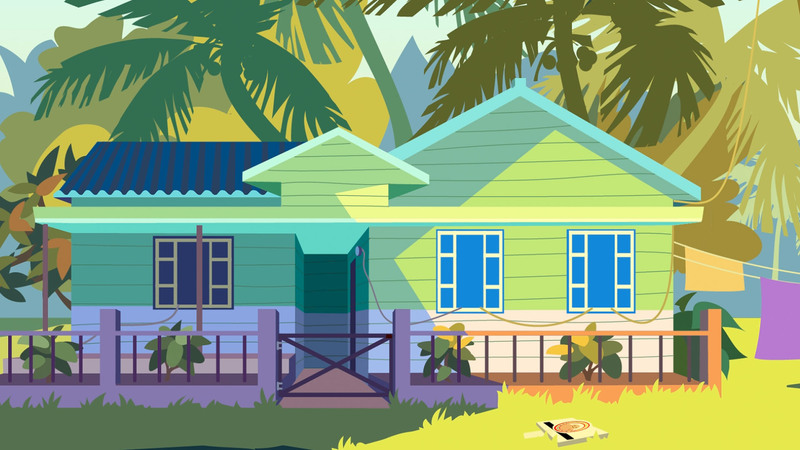 Lush fauna surrounds your house, your backyard, your school, the mechanic’s car shop. You learn to live with it symbiotically: Torrential rain doesn’t care if you’re late for work. You have to pull over, wait for it to pass, and then you continue with your day. It’s a powerful force intrinsically intertwined with your daily life - it’s a part of your identity. I wanted to pick an element that could thread across the film to help create Anais’ identity. Water is present in the film in many forms: in the rain, in the ocean, in the abalone shell, in Tiku, in the whale, and even with the moon. Water is a multifaceted life force; it’s a symbol of strength, it can be connected to our sadness, it can be cleansing, it can help us let go. It’s a life force with deep ties to the human experience. The ocean is immense, beautiful and healing, in both its power and gentle, intimate ability to ground and nourish us. Anais’ relationship to nature gives us her identity as a Costa Rican. It also helps her identify that no matter where she goes she will always have a connection to that part of herself. This is the lesson she gains from Ceiba. This lesson is comforting; her identity serves a purpose: It grounds her, and we anticipate as the audience that it will help her tap into her resilience. It’s important that as a viewer, we are introduced to her identity because we want to humanize her. The elements are a vehicle that helps us understand who she is and helps us reshape our ideas about who immigrants really are. PBS: The whale plays two different roles in this film, both as the enemy and later when Anais is dreaming on the plane, her friend. Why is this? Pamela: The whale is neither an enemy nor a friend, rather a symbol of an ancient, natural force much like migration. When we meet the whale in Yelida’s fish story, it represents a hardship - a separation of the fish family (Anais’ family). It’s important to note, though, that the separation is not malicious but rather a natural one. The whale, in its immensity, separates the family unintentionally. Of course this is hard for Anais and Carlos to hear. All they hear is “separation,” so it becomes a source of Anais’ fear. "The whale is neither an enemy nor a friend, rather a symbol of an ancient, natural force much like migration." In her dream, Anais must confront this fear. She must become courageous. The whale serves as a vehicle for Anais to face her fears. By doing so, she is able to meet Tiku in the sky. This is where we see the whale is neither a friend nor a foe, but rather a natural life force filled with fluid purpose. In this scene, we see the foreshadowing of loss - it’s the last time we will see Tiku and Anais’ loving friendship. As audience members, we don’t know what’s coming, and neither does Anais. Regardless, we are allowed a moment that is rooted in the courage that love inspires. It’s a way of saying goodbye that provides closure, even if it’s only in a dream. Loss is hard regardless, but there is a sense of peace you get if you live courageously, not letting doubt linger or hold you back. This is the message I wanted to send, especially to immigrant families who no doubt face the feelings of loss on a daily basis.